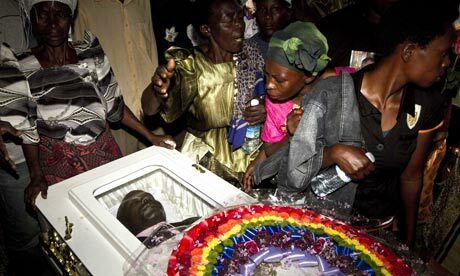 All those murdered for their honesty in choosing to live in conformity with their innate gender. Today, on Transgender Day of Remembrance, we commemorate those who were killed due to anti-transgender hate or prejudice. The event was founded in 1999 to honor Rita Hester, whose murder on Nov. 28, 1998 sparked the “Remembering Our Dead” web project. Since then it has grown into an international phenomenon observed around the world. It serves the dual purpose of honoring the dead and raising public awareness of hate crimes against transgenders — that is, transsexuals, crossdressers, and other gender-variant people. 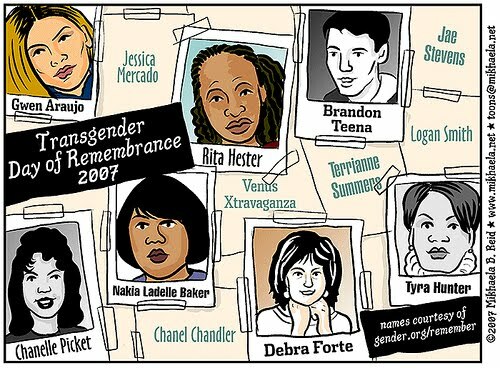 Mikhaela Reid pictures some of the more prominent victims of anti-transgender violence in the cartoon above: Rita Hester, Brandon Teena (subject of the movie “Boys Don’t Cry”), Gwen Arujo, Chanelle Picket, Nakia Ladelle Baker, Debra Forte, and Tyra Hunter.